The body of this sculpture can be dated to the second century after Christ. The head was added later during one of the many careful restorations of this sculpture throughout the centuries. It is made of Italian marble, stands 7′ 4″ high and is directly facing visitors as they enter the gallery. With the relevant information Carved from Greek marble in the second century, this sarcophagus inspired etchings attributed to the studio of Ghirlandaio, the studio where Michelangelo studied for a year before moving to the Medici palace. It is a prime example of the importance of preserving our artistic heritage. Just as Michelangelo inspires artists today, so ancient sculpture inspired Renaissance artists. 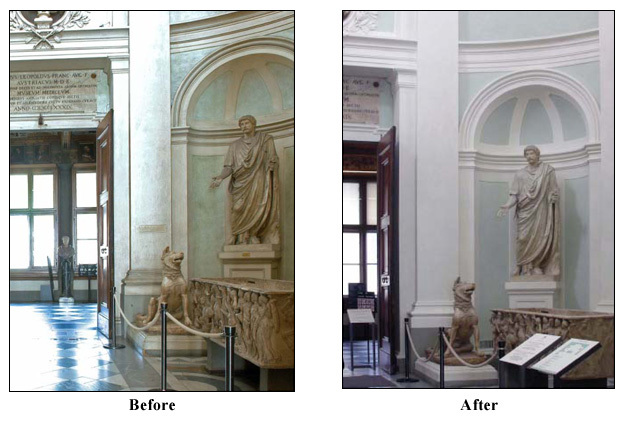 The renovation of the grand entrance way to the Galleria degli Uffizi, comprising the staircase and the vestibule of the Lorraine as well as the restoration of the works of art – ancient and modern – contained within, is the concluding episode of a complex intervention that involved the prompt and generous collaboration of public and private institutions: the Galleria degli Uffizi, the Soprintendenza, the Amici and Friends of the Uffizi and the executors of the restoration. Careful documentary research and cautious preliminary investigation provided the necessary guidelines for the overall program of restoration, the most evident being the decision to revive the walls of pale green in alternation with the ivory-grey tonalities of the structural members. The effect, enhanced by the elegant refurbishment of the entrance way and the cleaning of the ancient marbles, re-establishes in the present the cultured magnificence so deeply part of the Gallery, once again the designated theater of the paragon between the Ancient and the Modern. Cristina Acidini, Soprintendente per il Polo Museale Fiorentino.